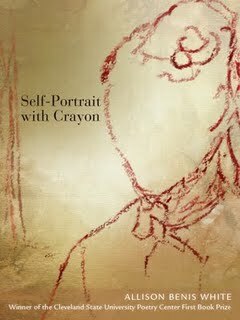 Allison Benis White’s Self-Portrait with Crayon, chosen by Robert Hill Long as the winner of the Cleveland State University Poetry Center’s 2008 first book prize, contains a linked series of searing prose poems which circle around the idea of looking. White explores the motion and means of the body, and of its representations in various media: dance, poetry, art about dance, poetry about art about dance, and so forth. This is ekphrasis taken to the next level, beyond mere representation of art into questions about the very nature of art and representation itself, about seeing and looking and the lenses through which we choose to see. Creativity, like pregnancy, becomes a process of possibility, linked to the Russian nesting dolls White describes in “The Bellini Family,” with “one Russian girl inside another.” We carry within us different possibilities, different lenses and methods of perception which can create the way that a woman’s body creates, preserves, and bears a child. White speaks of her desire for “several bodies to open and put back inside each other, to increase, then decrease when they are overwhelmed.” Creativity, then, is a corollary of the process of creation which also promises reversal, the mind, like a mother’s muscles, snapping taut into place after birth. Still, the promise of salvation, which is stillness, pushes beyond all such fears with its promises of peace and of a new kind of being which is and remains, rather than swirling continuously with time, into difference, and therefore into change: “And when she is gone, only the backs of their heads who stand and applaud into the absence of movement. Nothing else will happen.” This is God’s greatest blessing, which the artist attempts to replicate over and over, stilling the subject into salvation and offering the viewer a glimpse into the heaven in which they may forever be still, and therefore forever remain, themselves.